Scott, Dana, George and George Jr. Caught herring easily this morning and found breaking fish early. Thru pencil poppers at them and put downlines on them and had a ball for 30 minutes. After the action was over fishing got tough again. Fished hard the rest of the day, had probably 40 strikes, clients kept 8 Stripers For 58 pounds, largest fish were a 10 and a 12 pounder. The weather has been hot and the water temp is to hot for fish to be comfortable in. Very little oxygen in there blood makes the fish feel sick and they can't escape the heat because the thermocline is at 26'. 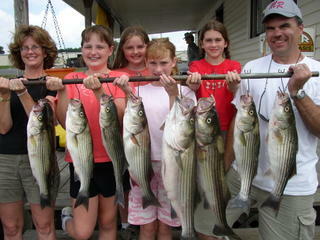 Saw fish breaking in the morning and had fun with them then struggled to catch fish on downlines the rest of the day. 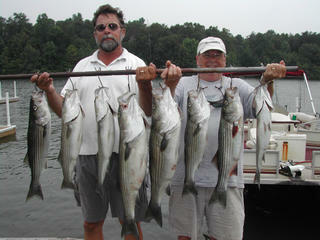 Had 40 to 50 hits but fish were striking short and lost most. 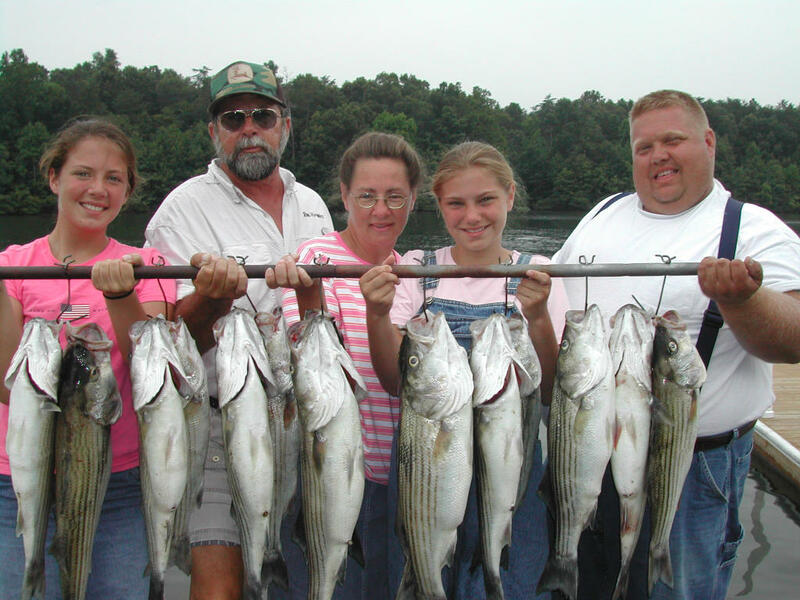 Clients kept 8 stripers for 36pounds. 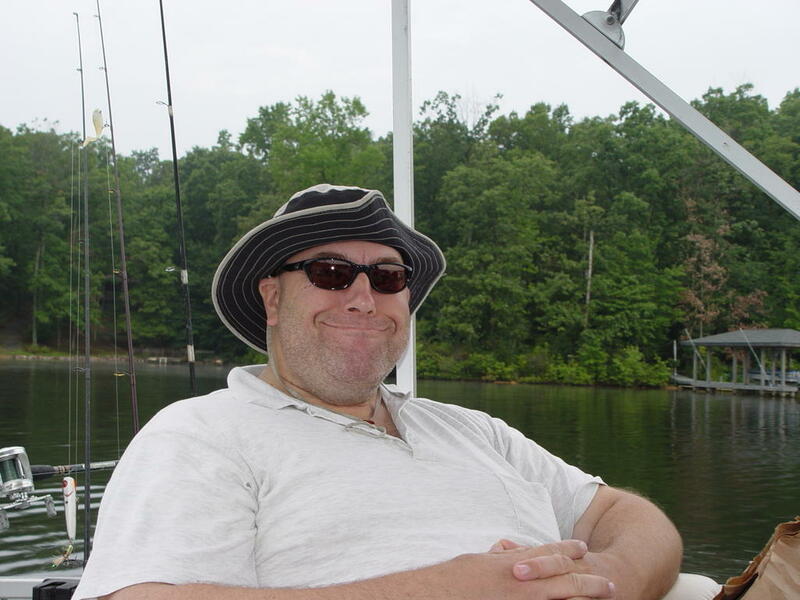 Fishing with regular clients today. Caught herring and found a school breaking early in the morning. Clients thru Pencil poppers at them and caught a few punks. I put downlines on the school and caught 8 but most were small. Left that school in search of bigger fish. Found another school and by 7.15 am we had our limit. Found 4 or 5 other schools and wore them out, releasing all of them. 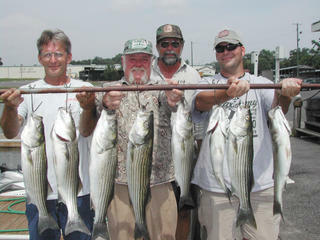 Clients caught 40 stripers, Kept 12 for 53 pounds. Today's fishing was tough. Caught herring easily and ran downlines on 25' to 45' flats with sporadic action. 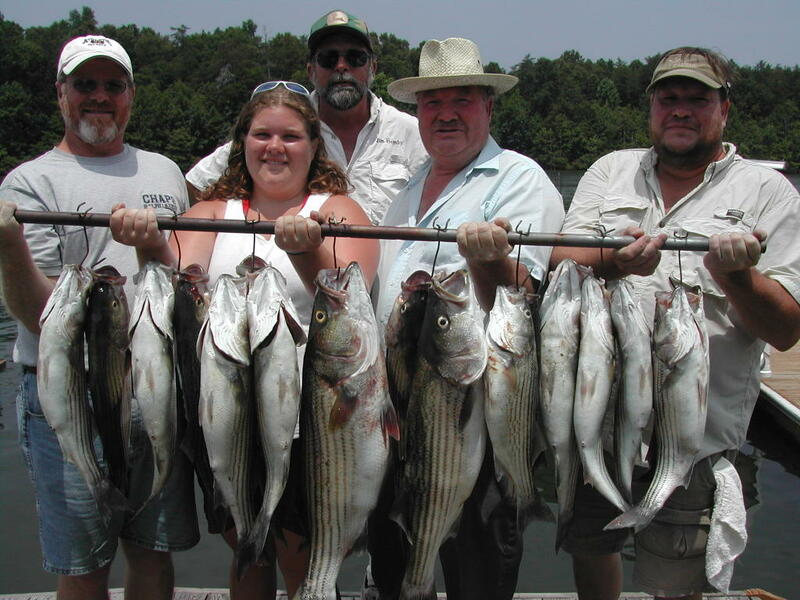 Fishing got better in the afternoon and ended up with 12 stripers for 53 lbs. Caught herring and fished downlines on 30' flats. Fishing was good and clients kept 12 Stripers for 67 pounds. Caught herring easily and fished flats in 35' of water. Fishing was good and we had over 50 hits, clients kept 16 Stripers for 84 pounds. Caught herring easily and ran downlines on 30' flats early in the morning with limited success. Had numerous hits but put only a few keeper fish in the boat. 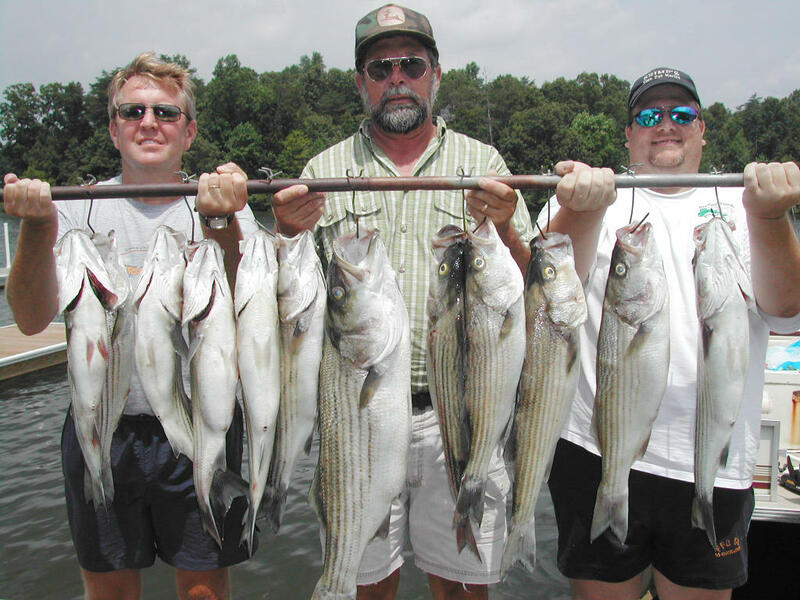 Worked our way downlake to the 40' to 50' flats and scored on some big schools of stripers. 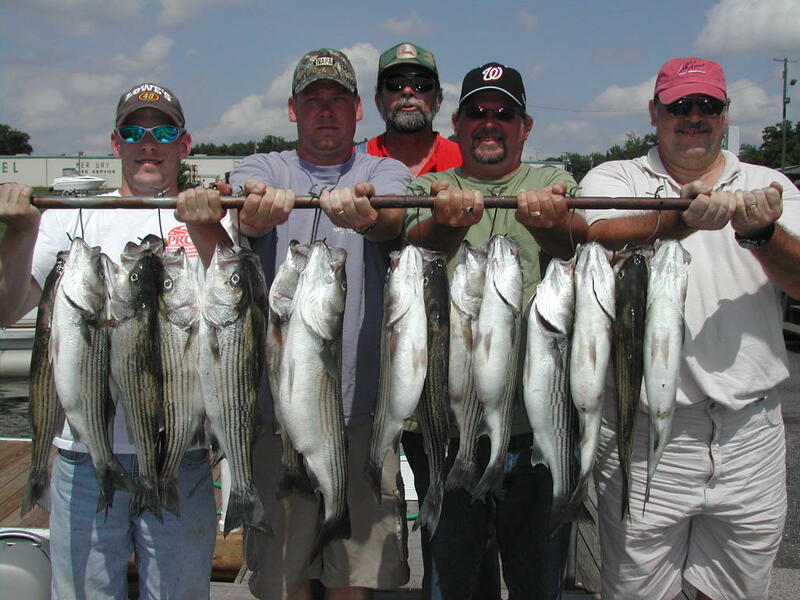 Lost count of hits but we went thru 125 baits catching stripers and cats. 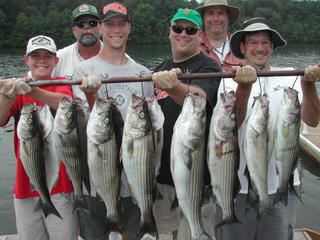 Clients kept 16 stripers for 84 pounds, largest fish 9.5 pounds. Did not fish the last 4 days due to boat traffic on July 4 th weekend. 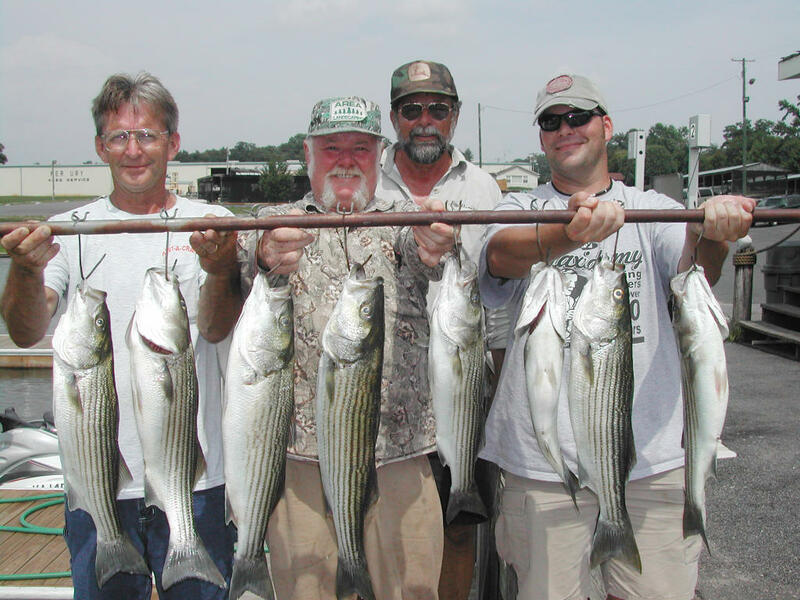 Tried a couple of areas around the splits , moved downlake and found a school by the powerplant, every line went off , lost count of fish cought but was in by 11 am, kept 8 stripers for 48 pounds, 2 over 12 pounds. Fished downlines on 25' flats With good success. 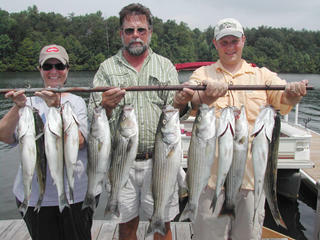 Clients had 50 hits , kept 18 Stripers for 81 pounds. 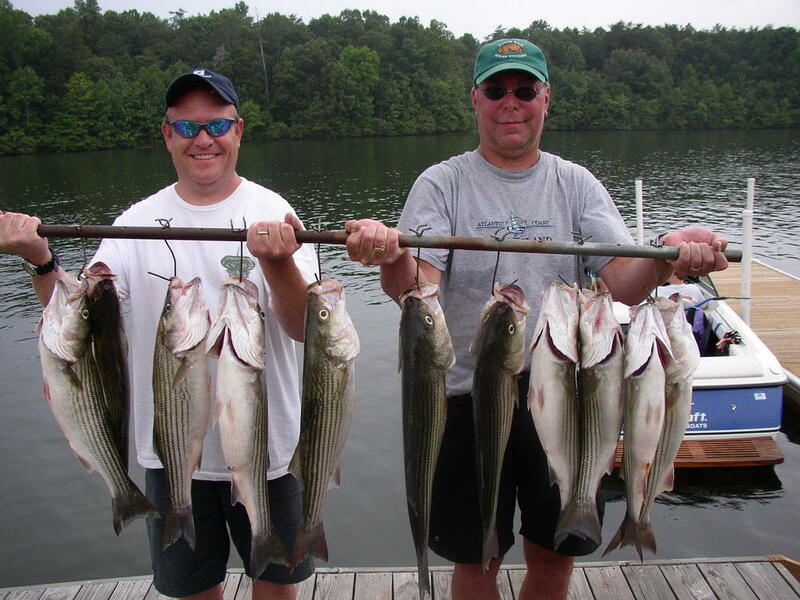 Another great day of fishing. We had constant action, had to catch herring twice, fished flats 30' deep. Must of had 80 to 90 good hits, Clients kept 18 stripers for 96 pounds.